For some people, camping means sleeping on the cold, hard ground. The more refined at heart, however, may wish to consider purchasing a camping cot. For these people, a camping cot can be the difference between tossing and turning all night long and sleeping like a baby in the fresh mountain air. If you’re ready to upgrade to a camp bed, you’ll want to know which camping cot is the best for you and your needs. The first Coleman cot on our list is also our top-rated cot on Amazon. The ComfortSmart™ Deluxe Cot offers a mid-priced, mid-range camping cot that will get the job done. The heavy-duty steel frame is sturdy yet lightweight, and folds up for easy portability. In fact, it will easily fit in the trunk of your car. It’s ideal for camping, but can also easily serve as an extra guest bed. Customers on Amazon report that this cot works well and lasts a long time. While some customers experienced some sagging in the middle, few thought it was bad enough to worry about and the ones that called Coleman about the issue found that their customer service was fast and helpful. It features an extra thick foam mattress pad with a patented ComfortSmart™ spring coil suspension for the most comfortable sleep possible. While it is a foam mattress (not an air mattress), Amazon users reported they had as a comfortable night’s sleep as in their own beds. Because it is only a foam mattress, what you may sacrifice in comfort you will gain back in ease of set-up, take down, and portability. Some reviewers suggested that an extra layer of padding was more comfortable, but most found that it was just fine without it. In fact, some said that they prefer this foam mattress to an air mattress due to both ease and even comfort, as it is both firm and soft. A few said that it was not as easy to fold up as they would wish, although many praised its versatility and how well it fit into tight spaces (like their trunk or between their fridge and the wall). This line of cot also comes in a few different sizes, in case you need to accommodate smaller sleepers or children. Some also said that they could set two of them side by side to make a queen-sized bed with no difficulty. Though it is compact, it unfolds to accommodate sleepers of up to 6 feet, 6 inches in height, and weighing up to 300 pounds. Folded, it measures 39.6 inches x 30.7 inches x 5.5 inches. It unfolds to 30 inches x 80 inches x 15 inches. Its unassuming gray color will stay clean for years to come, and the product comes with a limited one-year warranty. Amazon has some of the lowest prices, also, so look there for the most economical purchase. 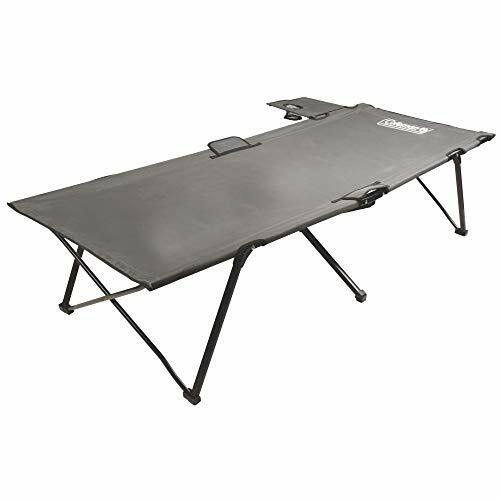 Overall, if you want a reliable, sensible camping bed that won’t break the bank, go with the Coleman ComfortSmart™ Deluxe. The Kamp-Rite Oversize Tent Cot is more than just a bed -- it’s your own home away from home. As the reigning tent cot on our top 10 list, this 90 by 32 inch mattress features a 420-denier nylon fabric tent canopy stretched over a sturdy aluminum frame. The aluminum legs keep you 11 inches off the ground, and the mesh doors and windows keep out critters and creepy-crawlies, just like a regular tent. Built with plenty of head- and elbow-room, this tent also doubles as just a plain camping cot and even as a lounge chair (it has an adjustable end that tilts up to let you catch some sun). It also comes in two sizes (single and double) and with a ⅜ inch foam insulating pad for warmth and comfort. 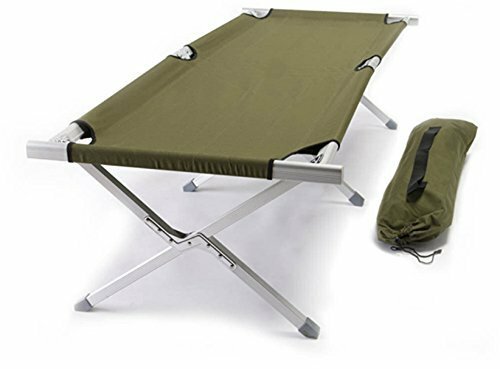 This tent cot is easy to transport and set up, with a heavy duty carrying bag and a quick set-up design. It’s also built to last: with anti-vibration nuts and bolts and a one-year warranty, you will be happy with your tent cot for years to come. Kamp-Rite is famous for developing the tent cot, and this one is well-rated for its success. Amazon reviewers report that it sets up easily in just a few minutes and has plenty of room for one person. It is, however, a little too cramped for two. Taller campers reported that it was a little small for them, but most were happy with the size and found that there was enough room for most of their gear. Some added an extra mattress pad or air mattress and were happy for the added padding, but some used it with just the included surface and a sleeping bag. Users were also happy with the shelter it provided them. Though not a tent that is rated for rough weather, they nevertheless found that it kept them warm and dry, even in below-freezing temperatures. Because it is both a tent and a cot, it can be a little difficult to store and carry, as it is a little bulky. 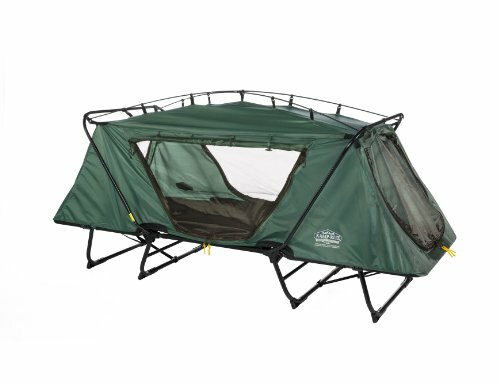 This tent cot is ideal for car side camping as you can easily pull it out and put it back in less than five minutes. This extra, extra large camping cot is designed with BIG comfort in mind! This cot is rated for up to 600 pounds -- just try and break it. It is also larger than a twin mattress, so whether you want to share it or keep it all to yourself, this cot is sure to deliver a great time. Whether you need it for camping, a base camp for hunting, or as a spare bed when visitors come, you may rely on this bed for its lifetime warranty and US-based customer service. 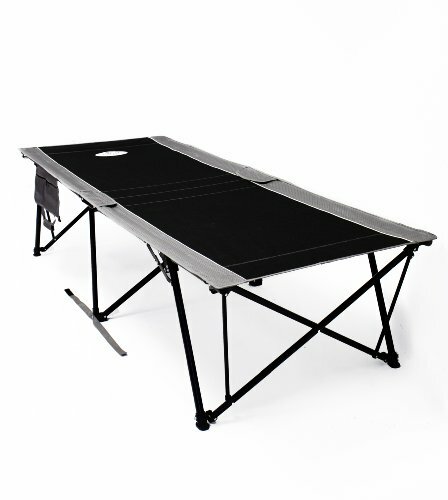 TETON’s patented S-curve steel design keeps the legs of this camping bed strong and stable, and 19 inches from the ground. There are channeled aluminum support bars at each end for added stability, keeping it firmly in place. The legs have redesigned rubber feet to give it a solid grounding on the tent floor and to protect from sliding. The frame is extruded aluminum and the sleeping surface is heavy-duty 600D Poly Canvas. TETON makes several sizes, so choose the one that is best for you, but the XXL is favored online for its ability to accommodate almost any size sleeper. Most of the reviews compared it to the size of a twin bed, and reported that it easily and quickly folds and unfolds for storage and set up. It is also comfortable: because of its larger size and with a little extra cushioning, it is comparable to a regular bed. The canvas sleeping surface is comfortable all by itself, but some users felt that an extra sleeping pad was needed to help it reach “real” bed status. Reviewers reported that this cot is very sturdy and also enormous, so it can be a bear to transport and pack away. It is also a little higher in price than the average cot. The manufacturer also makes an XXL cot pad and an attachable cot tent if you are looking for more features. TETON’s website includes a photo of 7 men standing on this cot; it holds firm. If you are prepared for a huge cot, this one will not disappoint. This one would be great as a base camp for lengthy trips or as an extra bed. 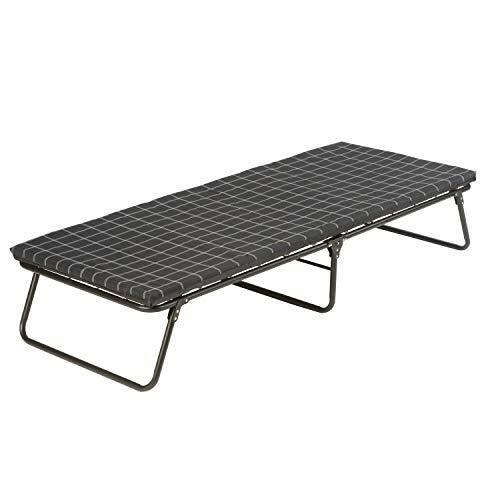 Blending the qualities of ease of set-up with the durability of a larger-sized camp cot, the Kamp-Rite Oversize Kwik Cot has a substantial weight limit of 400 pounds. With a sleeping area measuring 84 inches by 33 inches, the Kwik Cot folds down to a compact 42 x 9 x 8 inches. The 2 drop down pouches for storage on each side double as carrying pouches when the bed is folded, making for easy transportation. The heavy-duty x-frame design is both sturdy and light, easily folding out and up for a quick set up. A little bigger than some of the other cots on our list, it provides an excellent option for taller sleepers. It also has a padded head area for extra support. 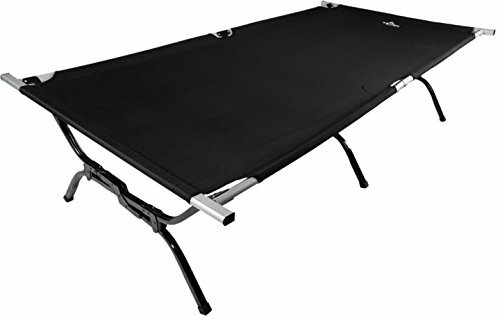 Camping cot reviews on Amazon report the Oversize Kwik Cot to be tall, reliable and comfortable -- good for both camping and as an extra guest bed. The Kamp-Rite “oversize” cot lives up to its name; users report that this cot is plenty big enough, no matter their size. They also report that it is easy to set up and take down. Though not as big as the TETON XXL, it is still extremely large, very comfortable, and unfolds and refolds in seconds, according to the reviews. Some users even report it as being almost too comfortable, evidenced by some people sinking in pretty far. Some also did not like how high off the ground it is, though others preferred this because it made it more like a regular bed. Most agreed that it was worth it, overall, and highly recommend this cot as a wonderful extra bed for when company comes. This Coleman cot is a bit different from the others on our list in that it features an Airtight® System air mattress, giving you the comfort of an indoor bed which you can take with you anywhere. You can even use this bed without the air mattress, allowing the air mattress to serve as an extra sleeping surface -- and giving you two beds for the price of one. Yes, you will pay a little more for this one, but it also comes with a 4D air pump to fill the mattress with ease. The cot surface uses a ComfortStrong coil system to provide the best support possible. Measuring 47.2 x 23.5 x 74 inches, it also includes a side table with a cup holder to give you even more space. A sewn-in cover keeps the mattress steady on the durable steel frame, and a Double Lock valve allows you to deflate the bed and fold it easily into its included carry bag for transportation and storage. If you are looking for a luxury-level sleeping experience, get the Coleman Airbed Cot. Amazon reviewers report that this air mattress stays pumped up for camping trips as long as a week, and stayed firm set up in a house for as long as a month or more. 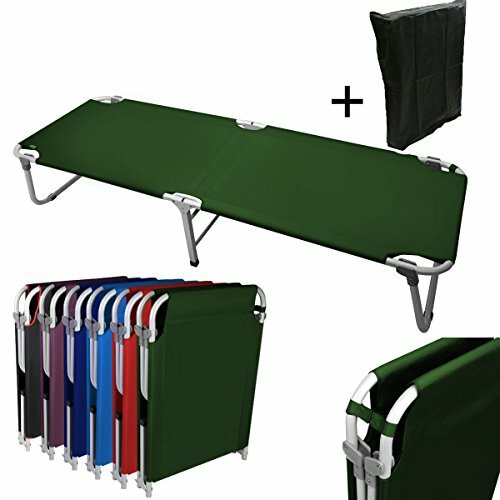 It is a little heavy to carry and set up, but users agree that this is a great bed, both for camping and as a guest bed. The air mattress is a crucial feature because it provides a much softer, almost bed-like sleeping experience for people of all ages. Now that you understand your options, let’s look at some of the different considerations you will need to keep in mind when making your decision. Not all beds are created equal, and neither are all camping cots. Most of the top camp cots are the standard size for one person, ranging from 70 inches long (5 feet 10 inches) to as much as 90 inches for the larger ones (7 feet 6 inches). In width, they range from 23.5 inches to 40 inches wide. Cots, as you can see, are meant to be smaller than “real” beds. This makes for portability and ease of set-up, but might be confining if you like more space or want to share. If you are looking for something larger, make sure to take this into consideration as you shop. Not to worry -- there are plenty of larger options for all sizes of sleepers! Some are built to accommodate individuals of up to 6 feet or more, so make sure to check those out as well. Standard camping cots are equipped with foam mattress pads or nylon stretch surfaces, but some come with their very own air mattress for deluxe comfort. While air mattresses provide you with more softness (and are almost like sleeping at home), you will sacrifice some portability and ease of set-up. Make sure you consider whether you value efficiency or comfort more, as this will make a difference as to what kind of mattress you choose. You may also wish to supplement whatever bed you buy with a sleeping pad or foam mattress cover of your choosing, so be sure to consider this as you make your buying decisions. Standard beds can easily hold a sleeper of 200 pounds, but if you would like more security, there are sturdier options. Make sure to consider who will you using the cot before you buy one. Thankfully for us all, some beds are rated to 300 or even 600 pounds. This is crucial if you are an extra large adventurer or wish to sleep two to a bed. Most cots are built to expand easily, with a foldable design, but some may have to accomodate extra features (such as an air mattress or tent top). Be sure to think about how much time you want to spend setting up your bed as you are looking at your options. Some reviewers report being able to set up and take down their camping cots in less than a minute. If this is important to you, consider a cot that is designed for such simplicity and speed. If you would rather have comfort over convenience, maybe that is less of a consideration for your purchase. Some of the best cots are actually mini-tents in and of themselves, as they have a small canopy over the top. These usually accommodate only one person, and snugly zip up the side. You may wish to consider this option if you want a two-in-one all-camping product, or want some extra privacy in a larger tent scenario. While tented cots cancel the necessity of a tent, they are possibly better for solo treks though they may not be as sturdy as a “real” tent. You can, however, set tent cots up incredibly quickly and avoid the necessity of setting up both a tent and a camp bed. 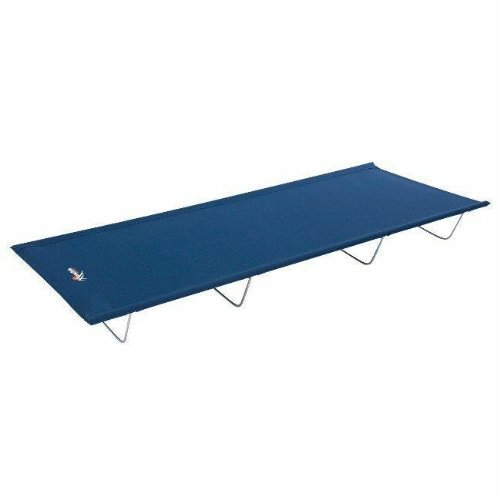 The most common type of camping cot is a standard foam mattress or fabric sleeping surface stretched across metal springs. Each brand or model may have variations on this type, but they generally work the same way. Different brands may use different types of foam or nylon stretch fabric across the springs, but the basic concept stays pretty consistent. Customers report these to be durable, easy to set up and take down, and comfortable enough -- especially for people who like a firmer night’s rest. For a quick, convenient night’s sleep, you can’t go wrong with a standard foam mattress foldable cot. If you need a softer, comfier sleeping experience, however, you may find that additional padding is a necessity, like foam mattress pads. Standard cots are the most versatile option because they work well for both camping and in your home as an extra bed in a pinch. Some people need a fluffier mattress, and your air mattress may let you feel as though you are sleeping on a cloud. Air mattresses provide a similar experience to sleeping on a “real” bed, but do have the disadvantage of requiring you to blow them up before use. If you have an electric pump this is no big deal, but still takes a little longer, and requires you to deflate the mattress before storage. You would also need an electrical connection or battery if you are using an electric pump, unless you prefer to use a hand pump (which takes more time but is more portable). One huge advantage of air mattress cots is that the air mattress might be removable, in which case you could set the air mattress on the ground and get two beds for the price of one (and an air mattress will cost you more). Some people even report that air mattresses are less comfortable than a standard foam mattress, if the customers prefer to sleep more firmly. Air mattress cots are useful for camping, but even more useful in your home as an extra bed because they sleep almost as well as a regular bed. These are just two of the brands that you will see in our list of best-reviewed camp beds. After brands there is a full buyer’s guide, detailing of the types of things you will want to consider when choosing the best camping cot for you. If there’s a brand that flies high above the rest when it comes to camping cot reviews, it’s Coleman. 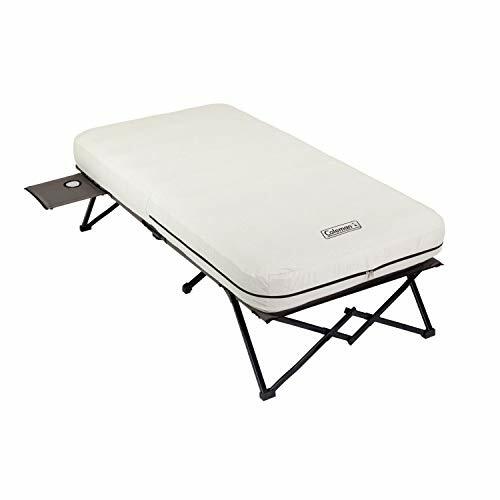 In fact, three of the camping beds on our top 10 list are Coleman products. You may be familiar with Coleman camping lanterns; W. C. Coleman developed these famous lamps based on a vision that has grown for over a hundred years. These lamps have had an important history for US servicemen in both the World Wars as they gave the steadiest, clearest light. It did not stop there, however. Coleman’s business spread beyond lanterns to camping stoves, coolers, tents, and every outdoor recreational tool imaginable. It’s no wonder that so many Coleman products made it onto our Amazon top 10, as customer reviews report Coleman camping cots are reliable, affordable, and comfortable. Check out the Coleman products on our list and consider one for your next camping trip or even as an extra guest bed when surprise visitors come. The second most popular brand is Kamp-Rite, as two of the cots are Kamp-Rite beds. Kamp-Rite is an up-and-coming innovative company devoted to specialty products that combine comfort with convenience. In fact, they take pride in having developed the original tent cot, creating something new out of two older traditional camping standards. Their brand has expanded to all kinds of camping goods and focuses on innovation and creativity as they strive to be the World Leader in Off-The-Ground camping gear. Though they came around at the turn of this century, they have already achieved success in providing practical and superior camping equipment to their customers, as well as committed customer service. So there you have it! Now you know a few of the things you should consider before you purchase your next camping cot. Be sure to read as many reviews of each product as you can before you make your decision and consider the parameters above. Especially important are the type of bed as well as the size and materials. Once you’ve looked at it all you will be ready to buy your camping cot and enjoy the sleep of your life!